In response to the rapidly dropping numbers of international adoptions by American families due to new regulations by the Trump Administration, Save Adoptions has created a petition to the White House clamoring for change. Since President Trump took office in 2017, his administration has reinterpreted international adoption regulations, leading to the closure of one of two national accrediting entities and adding a $500 international adoption fee for Americans looking to adopt abroad. These changes have not solved the ongoing crisis of dropping international adoptions (an almost 80 percent drop in the last 14 years). At American Adoptions, we respect every family’s right to adopt through the path that’s best for them — and we recognize the restrictions and changes to the international adoption process have made this path incredibly difficult for American families. We encourage those who wish to inspire change in the legal process of intercountry adoption to sign Save Adoptions’ petition here. The petition requires 100,000 signatures to receive a response from the White House. That number must be reached before April 16. 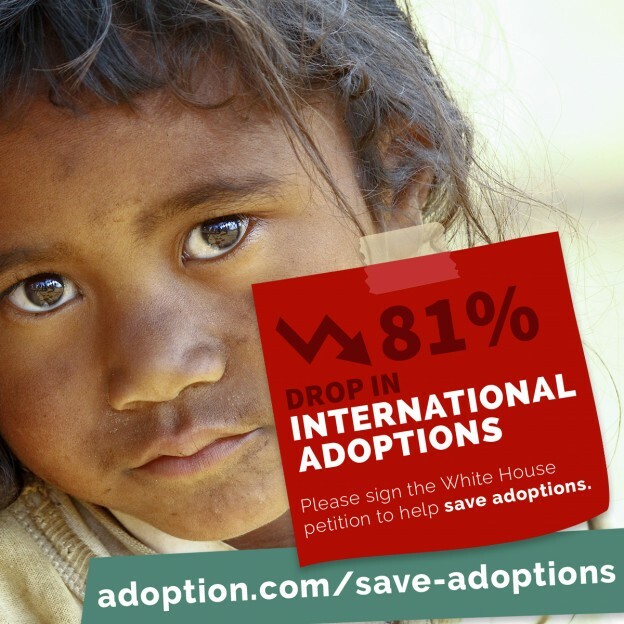 To learn more about Save Adoptions’ mission to improve international adoptions, click here. To learn more about international adoption vs. domestic adoption, contact our adoption professionals at 1-800-ADOPTION.